DisplayHDR certification has been popular among display OEMs. The intention of the standard is to highlight the display performance on offer to consumers across monitors - and its probably good for sales. VESA's standard encompasses metrics of white luminance performance and colour bit depth performance. Now it has been extended to include improved 'black level performance' and qualifying monitors can gain DisplayHDR 400 True Black or DisplayHDR 500 True Black certification. You can find the official summary of DisplayHDR Specs on this dedicated VESA web page. Scrolling through the standards you will notice the new DisplayHDR 400 True Black and DisplayHDR 500 True Black certifications with their performance criteria. Those who have been watching the VESA DisplayHDR standard more closely will also notice that there is a new DisplayHDR 500 level of certification (Goldilocks?). 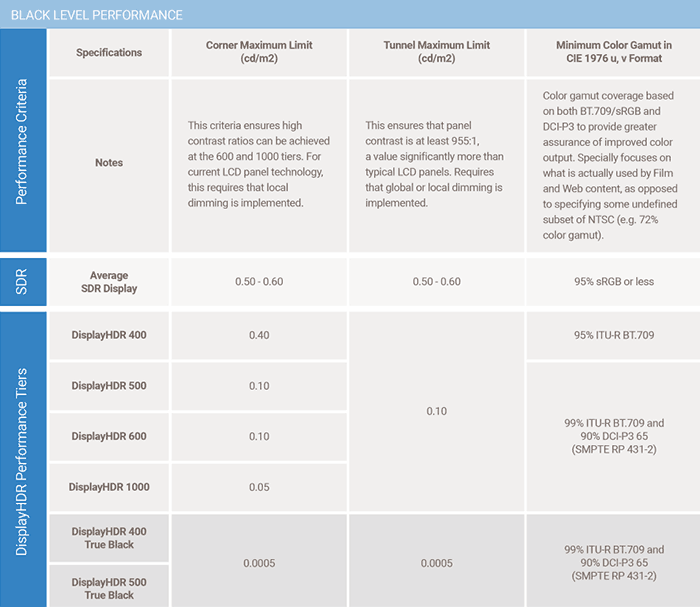 See full specs tables standards comparison here. Regular HEXUS readers will be aware of the significant differences in LCD and OLED display technologies. The new VESA DisplayHDR True Black high dynamic range standard has been tailored with the unique qualities of OLED (and upcoming microLED) technologies in mind. It brings the permissible black level down to 0.0005cd/m2 – the lowest level that can be effectively measured with industry-standard colorimeters. Thus DisplayHDR True Black allows for "up to 100X deeper black levels in addition to a greater dynamic range and a 4X improvement in rise time," compared to VESA's DisplayHDR 1000 performance tier. VESA says it already had DisplayHDR True Black in mind when it set out the original HDR standards. It refers to the standards as catering for "incredible, high contrast and high dynamic range," displays. We are told that "for gamers and movie watchers in subdued lighting environments, displays adhering to the DisplayHDR True Black specification can provide incredibly accurate shadow detail and dramatic increases in dynamic range (up to 50X depending on lighting condition) for a truly remarkable visual experience." In a nutshell the 'true blacks' (or absence of backlight) on offer via OLED panels make a big difference to our image perception on screen. It is hoped that the new DisplayHDR True Black standards will provide clarity to consumers looking for the best new OLED TVs and monitors. VESA adds that its other new standard, the regular DisplayHDR 500 standard, will be "ideal for ultra-thin notebook designs," as well as PC monitors.